Ganesh Chaturthi also known as Vinayaka chaturthi is one of the most sacred and major traditional festivals celebrated in India with great enthusiasm and devotion. The festival marks the birth of lord Ganesha; the lord of knowledge, wisdom, prosperity and good fortune. The festival is observed in the Hindu calender month of Bhadrapada , starting on the shukla chaturthi ( fouth day of waxing moon period) and last for 10-12 days ending on Ananth Chaturdashi (14th day of waxing moon period). People bring home murti (idol) of Lord Ganesha and celebrate the festival by worshiping the Lord in a special way for a day and a half , 3 days, 5 days , 7 days or 11 days depending on the family tradition and commitment of each individual. 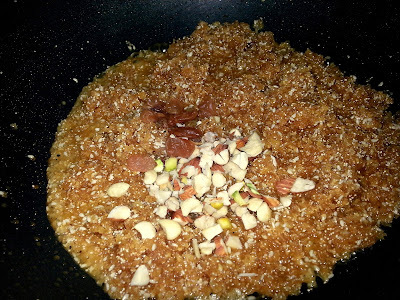 To please Lord Ganesha , various kind of food is offered as Naivedhyam during the Pooja. Modak and Ladoo are supposed to be Lord Ganesha's favorite sweets. 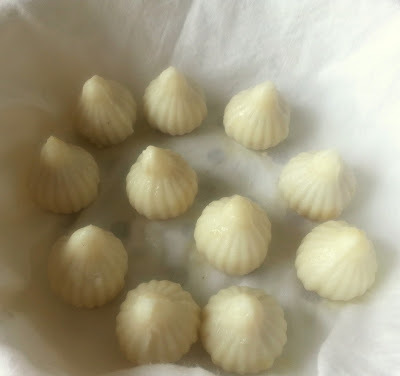 Today I am going to share a Modak recipe from Maharashtrian Cuisine. Ukadiche Modak are basically steamed rice flour dumplings stuffed with fresh scrapped Coconut, Jaggery and Nuts. 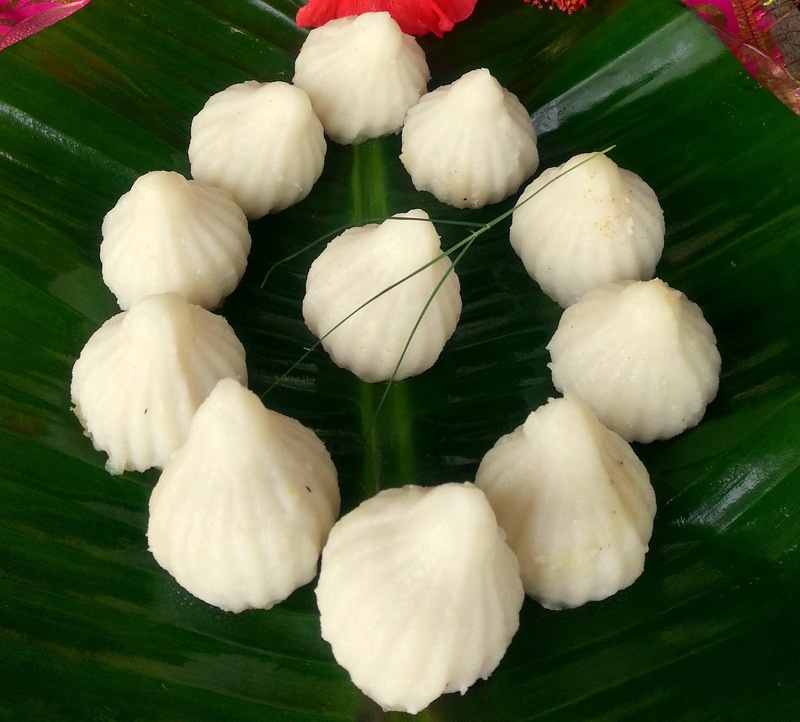 Ukadiche Modak are not only mouth watering and delicious dessert but also are visual treats !! 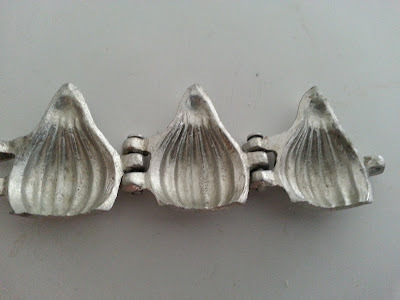 Traditionally these Modaks are beautifully pleated and shaped with hands, but this is not an easy task , I will be sharing that technique some time later, for now I have used a greased mould to shape the Modaks. 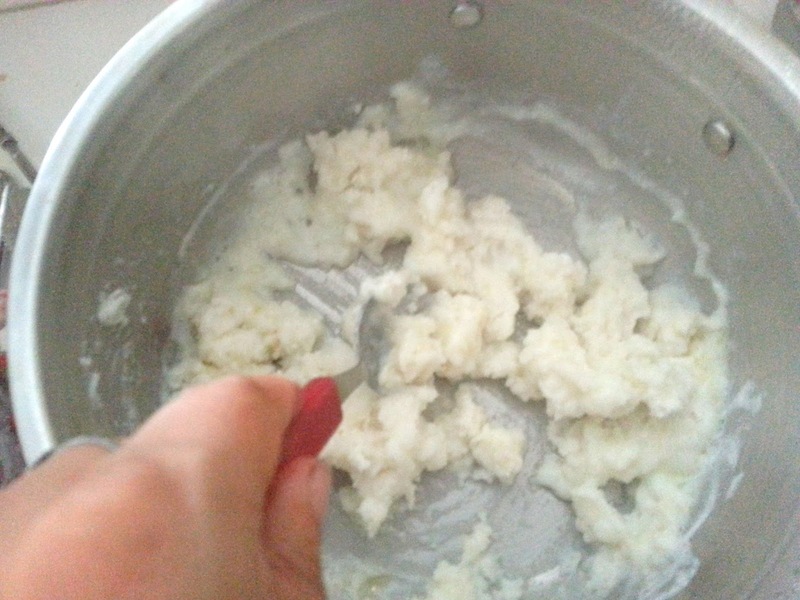 This is my Moms recipe and I have prepared the rice flour (Tandalachi Pithi) also at home , the way she does. 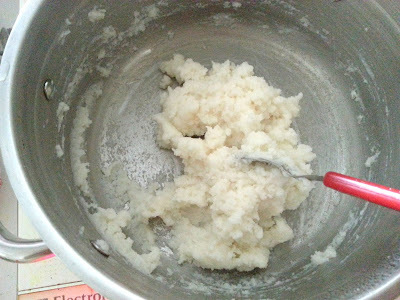 You may use the ready made rice flour available in market , but if you wish to make it at home, the procedure is as follows. Take 1/2 kg Basmati rice , wash and drain it. Let the rice dry for about 1/2 hour and then grind it in a grinder to powder. Strain this powder . 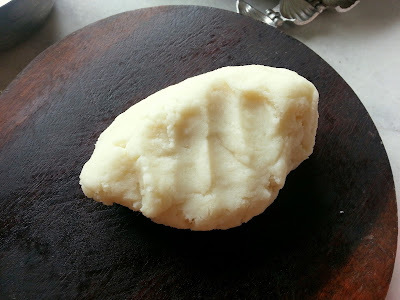 Use this rice flour to make the Modak. For the covering, in a heavy bottom sauce pan or wok heat 3/4 cup water and add milk and ghee in it. Once the mixture starts bubbling add the rice flour. 2. 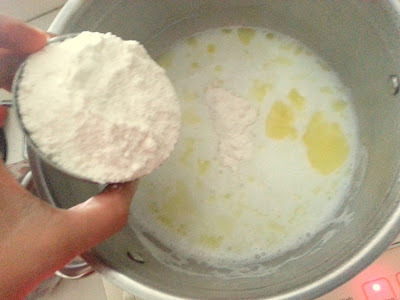 Now start mixing the flour vigorously with the milk and water mixture. Stir for 1 minute or so on low heat and then turn off the flame . 3. 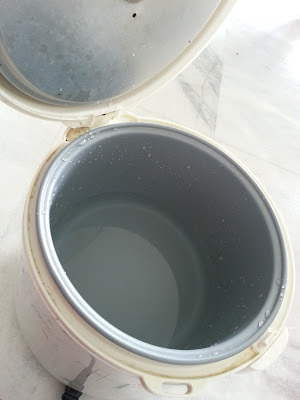 Keep the mixture covered for 5-7 minutes. 4. Mean while we can prepare the stuffing , for that heat a non stick wok and add grated Jaggery to it. Once the jaggery start melting add 1 tbsp ghee and mix well. 5. 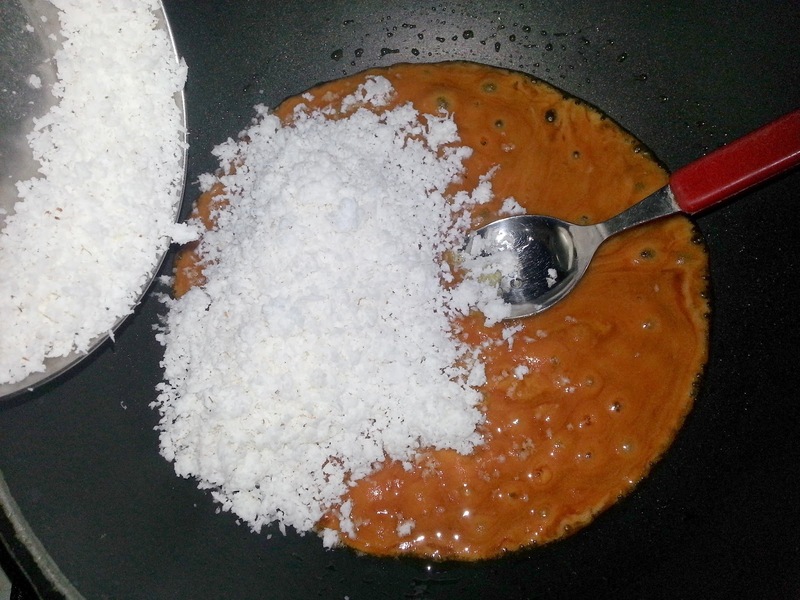 To the melted Jaggery add the scrapped fresh Coconut and mix properly. keep stirring for 1-2 minutes. 6. 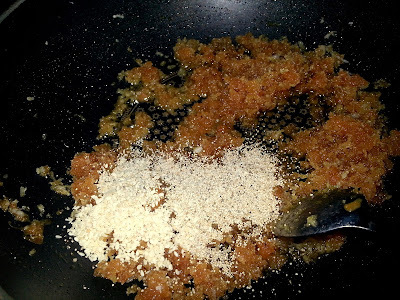 Now add the roasted Sesame seeds and Poppy seeds and mix properly. You will get a nice aroma while making this stuffing. Keep the flame low to medium. 7. Now add in the nuts and raisins followed by Sweet Masala. 8 . Put off the flame. 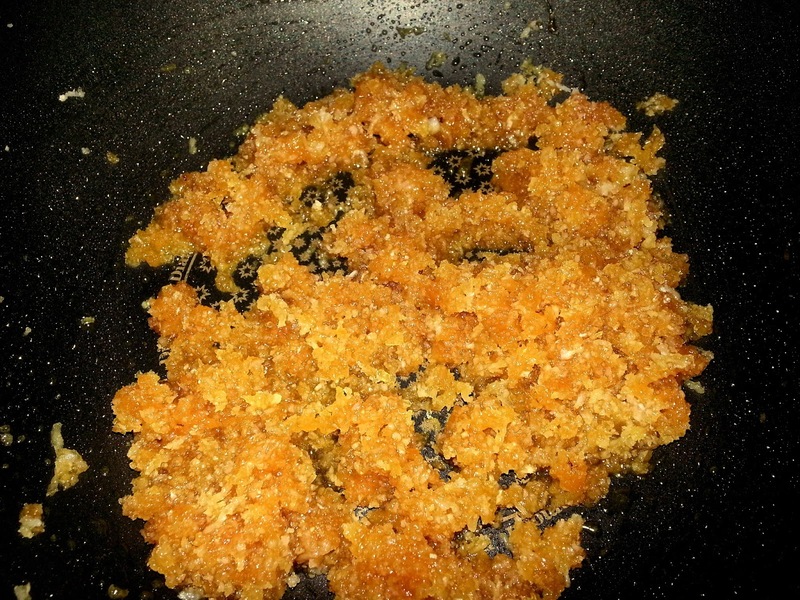 Do not over cook the stuffing as it may lead to further hardening of Jaggery. The stuffing is ready. You can use this stuffing to make Karanji ( Gujiya) also. 9. By now our cooked rice dough must have become cool enough to handle. 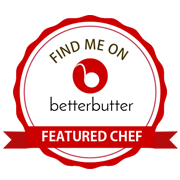 Remove the entire dough on a working platform and using little ghee bind together and knead the dough really well. Now keep it covered as we make Modaks. 10. 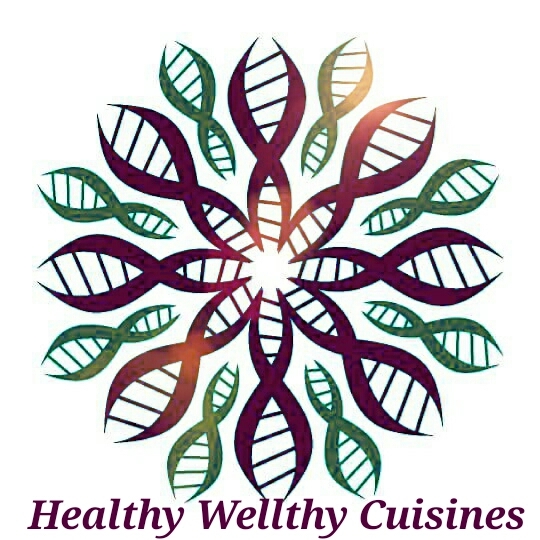 Pinch out a small portion and roll into a ball shape using your palms. 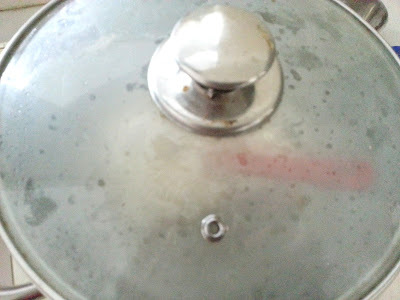 If you do not have a Modak mould, using little ghee flatten the dough ball into a small disc , there should be no cracks on it. Place small amount of stuffing on it and try to form pleats on the edges of the disc and then gather the edges to seal the Modak. For those using moulds, take the greased modak mould and from its lower open end push the ball inside the mould and press it alongside the walls of the mould using your fingers. This is to create space for our stuffing. 11. Stuff little mixture of the filling inside this space and using small disc shaped rice dough close the bottom. 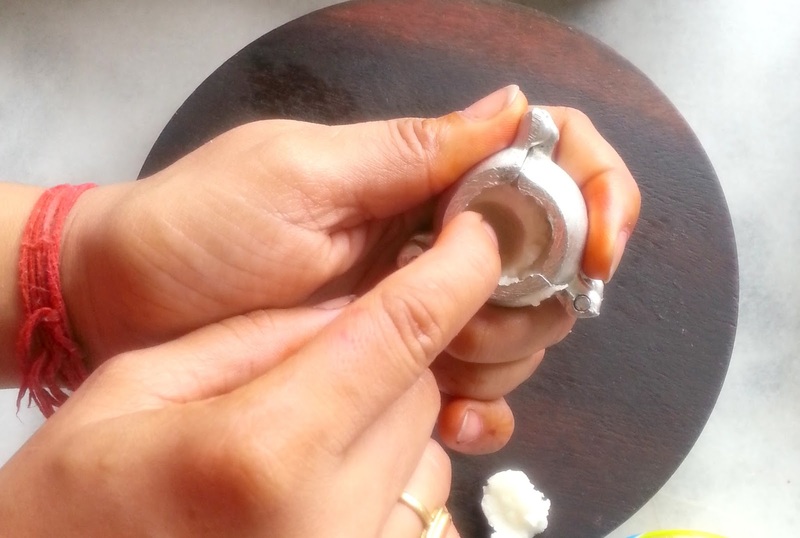 Now delicately open the sides of the mould to remove Modak. 12. 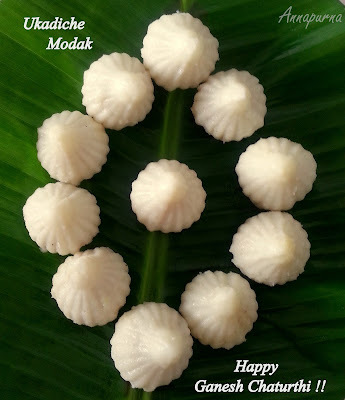 Similarly prepare all the Modaks. 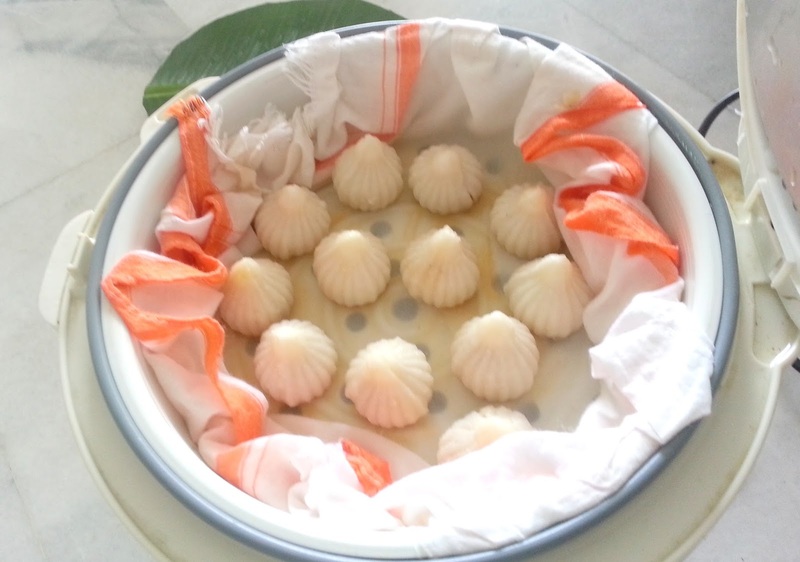 You can steam the Modaks for 7-8 minutes using a steamer or Pressure Cooker without a whistle just as we cook Momos. I have lined the colander of rice cooker with muslin cloth and placed the Modaks on it and steamed for 7-8 minutes. 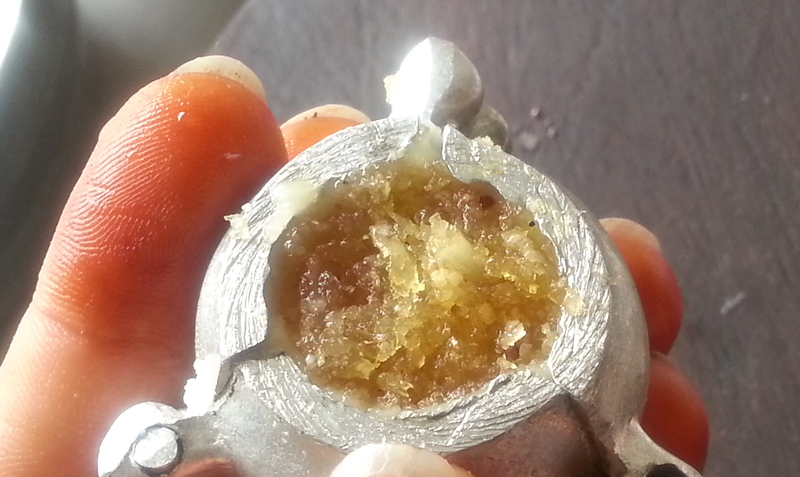 The texture of the Modak changes and we can see that they have cooked. 13. Slowly remove each Modak from the steamer and place on Banana leaf and offer to Lord Ganesha as Naivedhyam. Wishing a very Happy Ganesh Chaturthi to all those who celebrate . May Lord Ganesha bless you and your family with good health, fortune and prosperity !! While making stuffing , take care you do not over cook as it may harden the Jaggery and coconut mixture. Ensure you do not add more water or milk while cooking the rice flour. This will make the dough sticky. Do not add more stuffing as it may ooze out from sides. 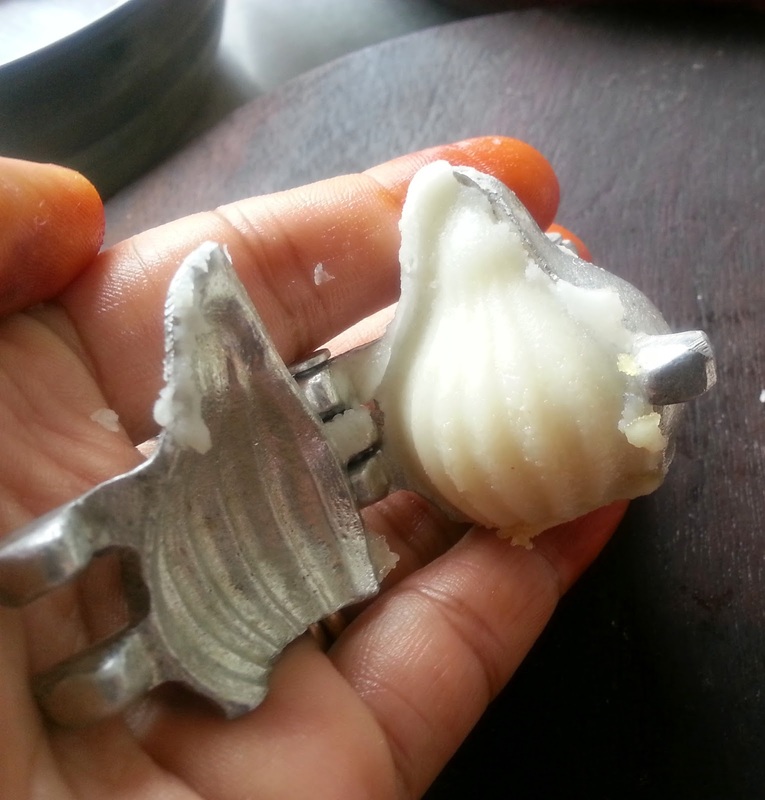 Grease the Modak mould every time to avoid sticking and breaking of Modak. 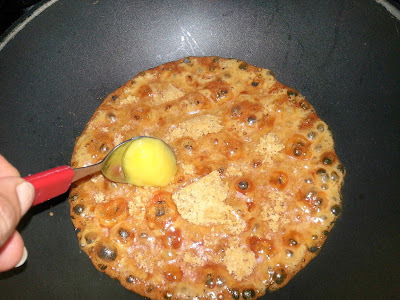 Take care not to place the Modaks very close while steaming. While making the Modaks, If you feel that they are getting dried out , dip the modaks in a bowl of milk and water before placing them in the steamer. 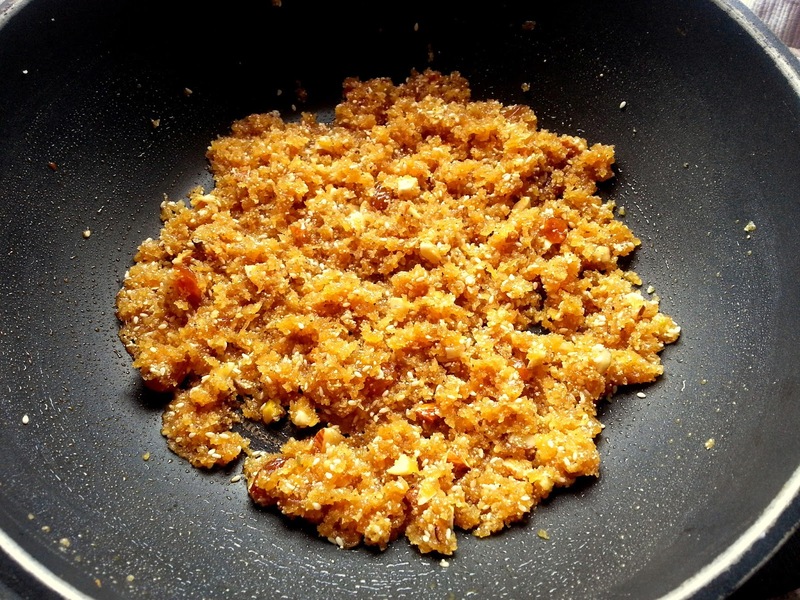 The stuffing we have made for Modaks can also be used to make karanji or Gujiya.